PG&E Pacific Gas & Electric (NYSE: PCG), is one of the largest combined natural gas and electric utilities in the United States. Based in San Francisco, with 20,000 employees, the company delivers energy to 15 million people in Northern and Central California. On July 20, 2006, California's energy regulators approved a program to roll out conventional meters retrofit with communications co-processor electronics to 9 million gas and electric household customers in the Northern California territory of PG&E. These meters report electricity consumption on an hourly basis. This enables PG&E to set pricing that varies by season and time of the day, rewarding customers who shift energy use to off-peak periods. The peak pricing program will start out on a voluntary basis, and the full rollout is expected to take five years. Early on, PG&E engaged directly with the Electric Power Research Institute (EPRI) and Southern California Edison Company and San Diego Gas and Electric Company, to develop and present to the California Energy Commission (CEC) the “Defining the Pathway to the California Smart Grid of 2020” report. After more than two years of collaboration, PG&E, EPRI and the other California utilities presented the Smart Grid report to the CEC in December 2010. Consumer Backlash - In this video, from January 2011, members of West Marin Citizens Against Smart Meters literally block the road to the small town of Inverness to prevent contractors from installing smart meters in homes there. This 2010 KCBS video reports on how some homeowners in Oakland's Manzanita neighborhood are putting Pacific Gas & Electric on notice: "Keep those Smart Meters away." In February 2012, two weeks after state regulators voted to give PG&E customers the right to opt-out of having a SmartMeter and keep their old, analog meters if they paid a monthly fee, PG&E announced Wednesday that it has received 4,400 opt-out requests. PG&E has about 5.4 million residential customers throughout its Northern California service territory, so the opt-out rate is about .08 percent so far. Those requesting to opt-out include 2,800 customers who still have analog meters and 1,600 who have a SmartMeter and want to make the switch. PG&E customers who want to opt-out of SmartMeters will be required to pay a one-time $75 fee and a monthly charge of $10. Low-income customers will pay an initial fee of $10 and a monthly charge of $5. The utility had estimated that up to 150,000 of its customers would opt-out, based on customer surveys and projections done last year. More than 90,000 customers have indicated that they do not want SmartMeters and are on a "delayed installation" list. PG&E said it is making an effort to reach everyone on the delay list by phone and certified mail. Information about the opt-out process will also be sent in March bills. "We're still in the very early days of the opt-out option," said Helen Burt, PG&E's senior vice president and chief customer officer, in an interview. "It's too early to draw conclusions about how many will begin to opt-out." On June 30, 2011, PG&E released its Smart Grid plan in response to a requirement of California Senate Bill (SB) 17 and the California Public Utilities Commission (CPUC) made in 2009 to each of the state's investor-owned utilities. The plan needs the commission's approval to take effect. Separate commission votes would be needed to authorize spending money on the technologies involved. PG&E's plan includes future projects that will take advantage of a wide range of advanced communications, computing, sensing and control technologies. PG&E will integrate these diverse technologies to improve service and reliability, lower customer costs and incorporate more renewable energy onto the grid. The plan would cost roughly $1.3 billion to $1.95 billion, spread over the next two decades, as PG&E adds sensors, communications equipment and new data-management technology to its electrical grid. At the same time, the new technology could save money by cutting PG&E's operating costs and enabling the utility to use electricity more efficiently across its vast network of wires. Those benefits - estimated to be worth $975 million to $1.95 billion - could cancel out the costs. 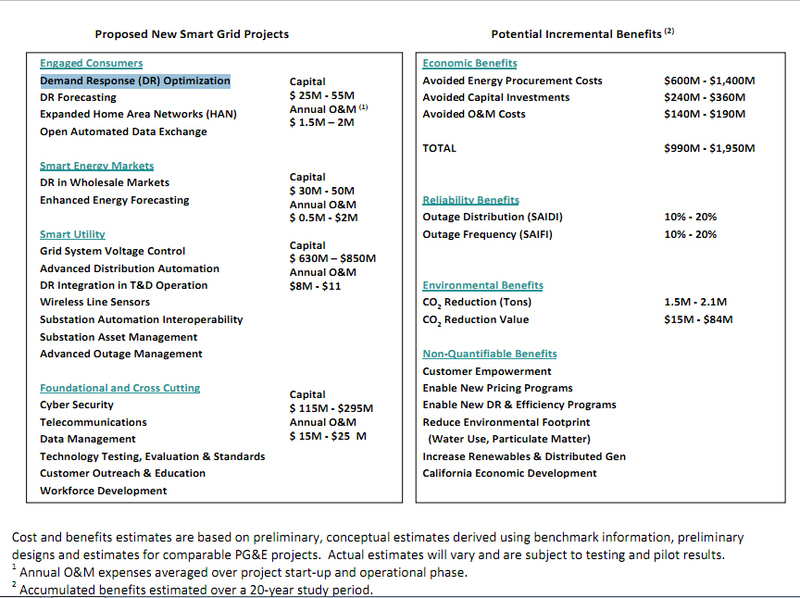 These cost and benefit estimates are necessarily conceptual, preliminary and subject to significant change at this early stage of Smart Grid project and portfolio development. If none of the benefits materializes, however, the smart-grid projects could cost individual PG&E customers $12 to $20 per year. colleges and other interested stakeholders. The goal is to promote the proper design, installation and commissioning of advanced lighting controls through training and certification of contractors. CALCTP is being piloted in 2009 and will be expanded into a full-fledge program in 2010-11. 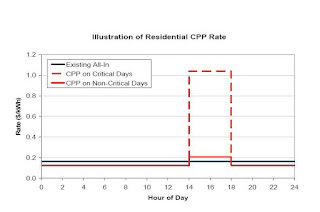 CPP – Critical Peak Pricing - Critical Peak Pricing programs offers lower electricity rates in return for setting a rate 3 to 5 times higher than the regular rate on up to twelve "Critical Peak" afternoons during the summer. Generally, the declaration is made one day in advance, but in some cases it is made just an hour before the higher rate goes into effect. Generally, the retail provider is limited – either by regulation or contract – in the number of peak days it can call in a year. At all other times, CPP customers are charged a non-dynamic rate, which may be time-invariant or may be time-of-use (TOU) based. Some CPP programs have multiple levels of critical peaks and associated retail prices, such as “peak” days and “super-peak” days, with the expectation that the higher-price days would be called less frequently. In California, Most classes have optional CPP rates. PG&E's Critical Peak Pricing Program offers customers the option of getting power more cheaply most of the time, if they agree to pay higher prices when the utility is facing peak demand. $600 million to $1.4 billion in lower energy procurement costs. $200 million to $400 million in avoided capital costs. $100 million to $200 million in avoided operating and maintenance costs. 10 to 20 percent improvement in system reliability. 1.4 to 2.1 million metric tons of avoided carbon dioxide (CO2) emissions. Smart Meters - PG&E got the sign-off from the California Public Utility Commission in March 2010 to charge ratepayers for an additional $467 million to bring 10 million gas and electric meters with two-way communications capabilities to its customers by 2011. That brings the program’s total cost to $2.2 billion, and allows the utility to officially add technology from Redwood City, Calif.-based Silver Spring to its electric smart meters. PG&E is looking to ZigBee to communicate between smart meters and in-home devices. 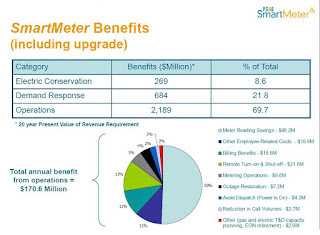 PG&E’s smart meter rollout has gone through a few changes since it was launched in 2006, including bringing Silver Spring on board to install its communications cards in electric meters from General Electric and Landis+Gyr. PG&E will start out by reading the meters remotely, eliminating the need to send workers out in trucks to read them. But the long-term goal is to bring a set of two-way communications between customers and utility to measure and control energy use — the promise of so-called “smart grid” improvements being undertaken by utilities across the country. That’s where the upgrade comes in. PG&E envisions using the smart meters to detect and pinpoint power outages more quickly at first. Eventually, it wants to connect smart meters to in-home devices that will be able to monitor and potentially control power usage by thermostats, appliances and other devices remotely, whether by the homeowner or the utility. HAN Enablement Program – Phase 1 - The HAN Enablement Phase 1 program consists of the development of IT systems to allow customers to register and commission a PG&E-approved, standards-compliant HAN device with PG&E’s AMI network to receive data from a SmartMeter™. For Phase 1, PG&E is deploying support to test in-home devices with selected PG&E customers. 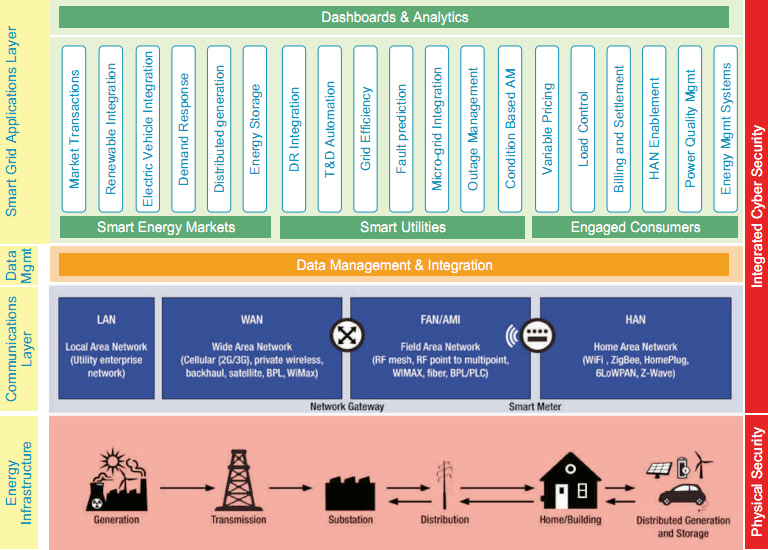 In addition to supporting customers who seek to outfit their homes with energy management devices, this program also gathers performance data to supports the development of new markets for home energy management and intelligent home devices. Transmission Substation SCADA Program - Under the Transmission Substation SCADA program, PG&E is in the process of installing new SCADA on the transmission system to provide PG&E’s Electric Operations and the CAISO with full visibility into the transmission system, significantly improving efficiency and operational flexibility. PG&E’s goal is to achieve 100 percent visibility and control of all transmission substations by 2014, adding or replacing SCADA for approximately 300 substations and approximately 700 breakers. Distribution Substation SCADA Program - The Distribution Substation SCADA program focuses on increasing SCADA penetration to support future Distribution Control Center consolidation and to improve reliability for PG&E customers. PG&E’s goal is to achieve 100 percent visibility and control of all critical distribution substation breakers by 2015, adding or replacing SCADA for approximately 300 substations and approximately 1,000 breakers. Modular Protection Automation and Control (MPAC) Installation Program - The multi-year MPAC program aims to deploy pre-engineered, fabricated, and standardized control buildings in transmission substations. The program is designed to improve reliability of the transmission system by replacing aging infrastructure and modernizing facilities. These activities are performed in an integrated manner with other PG&E projects such as capacity expansion projects, bus conversions, deficiency and aging asset replacement, control room condition improvements, reliability, and control center consolidation efforts. Regional Synchrophasor Demonstration Project - In 2009, the DOE awarded $54 million to the Western Electricity Coordinating Council’s Synchrophasor project to improve grid reliability and transmission efficiency as part of the American Recovery and Reinvestment Act of 2009 (ARRA). This regional project involves nine partner entities, including PG&E. As an award sub-recipient receiving $22 million, PG&E will install or replace synchrophasor technology, also known as PMUs, throughout its service territory, network them together, and provide the data in a secured interface to PG&E’s electric transmission operators, neighboring utilities, and the CAISO. Synchrophasor technology provides precise, real-time measurement of electrical qualities from across the electricity grid. These devices enable system operators and planners to measure the state of the electrical system and manage power quality. SmartMeter™: Outage Management Integration Project - Integrates the SmartMeter™ "Last Gasp" and Restoration messages into PG&E’s Outage Management System for outage notification to operators and dispatchers and improved outage restoration. The project will deliver: (1) the capability to create trouble reports from AMI alarms when an associated customer call has been received; (2) the capability to ping a transformer to determine if an outage is larger than it was inferred to be; (3) the capability to identify and display probable secondary fault locations based on unique alarm events and prior inference locations; and (4) the capability to ping individual meters to determine whether they have been restored. SmartMeter™: Transformer Loading Management Project - Enables T&D electric planning engineers and estimators to access actual customer usage data from SmartMeter™ for analysis in equipment sizing and voltage analysis. The solution will enable PG&E to report transformer (or multiple transformers) load based on interval usage data and the ability to drill down to month, week, day, and Service Point level to see the peak usage. The solution will also identify transformer (or multiple transformers) by load category (over loaded, under loaded) over the entire SmartMeter™ population. Cornerstone Improvement Project – Feeder Automation - In June 2010, the CPUC approved PG&E’s 3-year Cornerstone Improvement Project, which includes major initiatives that will increase the capacity and interconnectivity of distribution lines and substations, implement distribution automation on distribution circuits in urban and suburban areas, and install reclosers and fuses on rural circuits to reduce the number of customers affected by outages. These initiatives are expected to result in reliability improvements for PG&E customers. The Feeder Automation component of Cornerstone Improvement Project involves implementing feeder automation on approximately 400 distribution circuits. The project scope includes automating mainline protection equipment utilizing FLISR schemes to restore unaffected customers within five minutes. Distribution Management System (DMS) Project - The DMS project is a strategic systems implementation for the electric distribution system to provide increased grid visibility and control capability. DMS is an industry-leading technology solution that is increasingly being embraced by utilities across the country to help consolidate and automate core functions within distribution operations. The DMS is intended to improve upon the traditional paper-based and/or manual approaches used primarily by utility personnel today to better monitor, control, and optimize the performance of the distribution system. Network Supervisory Control and Data Acquisition (SCADA) Monitoring Project - The project will install new monitoring and control systems on the downtown San Francisco and Oakland secondary network systems including full remote control on network protectors (including remote setting of relays), and primary switches. The monitoring itself includes voltages, currents, temperature, oil level and chamber pressures. It may also include moisture, hydrogen level and other dissolved gas monitoring depending on feasibility and available technologies. For vaults, the monitoring system will include SCADA battery, water detection and may include others such as distributed generation monitoring and motion detection, depending on future strategy, needs, feasibility and available technologies. Real-time data collected from the equipment may be used for triggering of alarms for operation or maintenance activities, and trending for asset management decisions on maintenance and replacement strategies. The new SCADA system will also have remote operating capabilities that include vacuum switch control, network protector open/close, station transfer trip of the network protectors and group open/close. These new control features will improve personnel safety and system operability. Load Forecasting Automation Program - Will automate existing manual electric distribution system load forecasting to increase accuracy of the process and improve forecast documentation. Current and future SCADA data will be gathered and stored within the existing data historian system and will become an input to the new forecasting tool. Circuits with SCADA will provide hourly load data into the historian system and non-SCADA circuits will provide a single monthly peak load from monthly substation inspections. Additionally, this project will replace analogy bank demand meters with electronic recording meters. Data Historian Foundation Project - This project will implement enhanced data historian software for managing and analyzing operational data with select user groups in electric transmission (including the Synchrophasor Project), gas operations, power generation, and energy procurement. When deployed and integrated with other electric systems such as EMS and SCADA, the new data historian will serve as the central data archiving and analysis system for all time-series operational data. This solution enables PG&E operators, engineers, managers and executives to analyze, visualize, and share operational and business data in a manner that not only makes the most sense to them, but also informs intelligent decision-making throughout the utility value chain. The benefits of this capability include productivity improvements, situational awareness, reliability improvements, and regulatory compliance. Advanced Detection and Analysis of Persistent Threats (ADAPT) Cyber Security Project - The ADAPT project will take a proactive, preventative approach to cyber threat and incident management. This multi-phased project will build critical capabilities for PG&E to analyze, detect, prevent, and respond to the newest generation of cyber attacks. The project will also install cyber security software and hardware and establish a corresponding operational team and business processes to ensure effective, secure deployment of new Smart Gird and other related technology across the organization. SmartMeter™ Operations Center (SMOC) Project - The SMOC project implements telecommunication network operations management capabilities to support PG&E's SmartMeter™ network to handle growth in the number of deployed meters, effectively monitor the increased amount of data communications from the meters, bring new SmartMeter™-related customer services on-line efficiently, and enable timely customer response as well as proactive reliability and availability management. This scope includes designing and implementing a new SMOC for the day-to-day operations of the existing installed systems and ensure vendor production and operational commitments The Operations Center will be expanded in the future to extend capabilities to support SmartMeter™ and Smart Grid strategies. The SMOC will become a central hub to manage the operations of the SmartMeter™ network, grid network systems, and telecommunications network. Space Solar- On December 3, The California Public Utilities Commission approved PG&E's plan to purchase electricity from an orbiting solar panel plant in outer space, provided that it is successfully deployed. The San Francisco utility announced in April its space-ward intentions, and now that it has received the official green light from state regulators, it has contracted to buy 1,700 gigawatt-hours per year for 15 years from Solaren Corporation (website under construction), a startup from Los Angeles that plans to place satellites equipped with an array of solar panels into orbit, where they would soak up the sun’s rays—undiluted by atmospheric debris and uninterrupted by bad weather or nightfall—to fuel energy users down on Earth. The plant, which has an expected generating capacity of 200 megawatts and which Solaren plans to launch in June 2016, will transmit the solar power that it generates down to a site in Fresno, California, via microwaves, which—unlike lasers—can beam through clouds. Solaren, which is headed by veterans from aerospace companies, has already developed a system centered around a kilometer-wide Mylar mirror, for the purpose of concentrating sunlight onto the solar panels and extracting more power from them. Solid-state lasers are an alternatiave to RF. Such lasers now have enough power to deliver energy as a tightly focused optical beam that requires much less costly equipment in space and on the ground. But unlike RF, lasers can run into bigger problems with atmospheric interference and weather. Microwaves can beam through clouds, which lasers can't. Lasers require receivers in desert sites that are cloud free, and maybe backup receivers in several sites. Naturally, skeptics abound, especially since Solaren has kept the details of its technology largely under wraps and the hype over the project is so enormous. PG&E said that it would only pay for the electricity if Solaren delivers the goods. Yet even some of those questioning their own optimism over the project have expressed their faith in it, even if it never gets off the ground. Utility Owned Solar - In March, PG&E said it had opened the bidding process for the first project in its five-year, 500 megawatt plan for solar energy. PG&E wants to own up to 250 MW of solar photovoltaic generation, in addition to 250 MW purchased from third-party developers. The program represents PG&E's first investments in renewables in a decade and takes advantage of a change in the U.S. tax credits for solar that allow utilities for the first time to receive tax incentives. The program targets projects 1 MW to 20 MW on the ground or rooftops within its service area. The first bids PG&E is seeking are for a 2 MW pilot photovoltaic project to be completed this year mounted on the ground, adjacent to a PG&E substation. PG&E said applicants could be tapped for future projects. The 500 MW program is expected to deliver 1,000 gigawatt hours of power each year, enough to supply 150,000 homes. The energy would comprise 1.3 percent of the utility's electric demand. BrightSource - In May, PG&E announced two more deals with Oakland's BrightSource Energy for solar thermal projects brining the total to seven projects totalling 1.31 gigawatts. PG&E said the agreement represents the largest solar deal in the world. 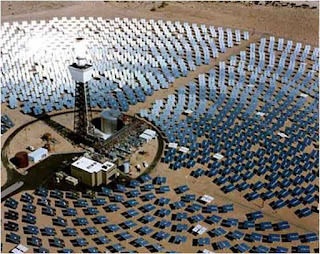 The first of the seven deals, a 110 MW plan in Ivanpah, Calif., is expected to come online in 2012. BrightSource has raised more than $160 million in backing from investors including BP Alternative Energy, StatoilHydro Venture, Black River, VantagePoint Venture Partners, Morgan Stanley, DBL Investors, Draper Fisher Jurvetson, Chevron Technology Ventures, and Google. NextLight - PG&E signed a contract in June with a subsidiary of NextLight Renewable Power for 230 megawatts of solar photovoltaic power, marking a another addition to the San Francisco, Calif.-based utility’s string of solar deals. The contract with NextLight subsidiary AV Solar Ranch 1 is expected, on average, to generate 592 gigawatt-hours of renewable electricity annually. NRG Energy - PG&E signed a deal in June to buy solar thermal power from NRG Energy, which plans to use the technology developed by eSolar. The agreement, signed with NRG's subsidiary Alpine SunTower, calls for Alpine to build and operate a 92-megawatt project close to the southern California city of Lancaster. NRG plans to complete the project by 2012. NRG took over eSolar's power project development business in the United States after it announced in February this year that it would invest $10 million in eSolar. Intermittent Renewable Resource Managment (IRRM) Pilot - In the IRRM pilot, PG&E is leveraging work from the C&I DR PLP to provide regulation services to CAISO market. The objective of the IRRM pilot is to demonstrate technically whether customer load can provide second by second frequency needs and follow CAISO controls to mitigate frequency issues and other possible grid problems. Proxy Demand Resources (PDR) Program – Phase 1 - PG&E is in the process of developing the required interfaces to enable its retail end-use tcustomers to directly participate in the CAISO’s PDR – Phase 1 program. The CAISO’s PDR Phase 1 program provides utilities with the necessary tools to forecast and bid available DR resources for a specific day in the CAISO energy market, as well as to implement back-end systems needed for bill settlements. Commercial and Industrial (C&I) DR Participating Load Pilot (PLP) - Known as the PLP, this project is an end-to-end “bid to bill” demonstration for certain commercial and industrial customers to provide non-spinning reserves to the CAISO market. The CAISO and PG&E utilize OpenADR (Open Automated Demand Response) standard as the communications platform, which is the same platform that is currently being used for PG&E’s Automated Demand Response (Auto-DR) Program. 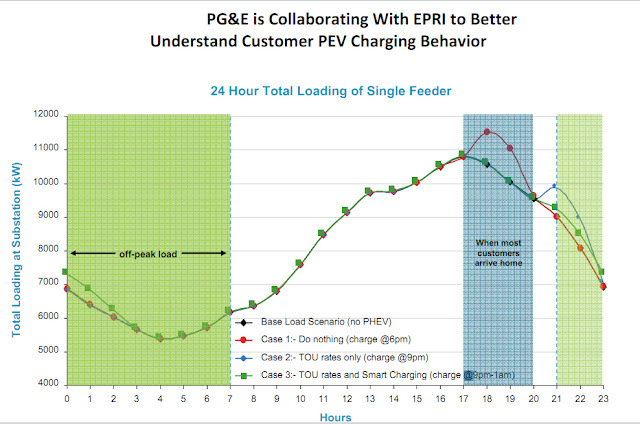 SmartRate - PG&E SmartRate trial of 10,000 customers showed 16% load reduction. Critical Peak Pricing - In July 2009, the CPUC directed PG&E to propose default critical peak pricing for all large commercial and industrial customers that will go into effect in 2010. PG&E was also required to propose default CPP for small and medium commercial and industrial customers that will go into effect in 2011. PG&E’s specific rate proposals are currently before the Commission. The decision also required PG&E to propose an optional real-time pricing rate for all customer classes that would be available in 2011. 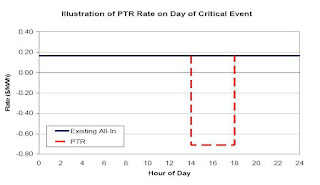 PTR - Peak Time Rebate - For residential customers, PG&E’s has proposed PTR program would offer new monetary incentives to encourage reduction of peak period usage on up to 15 event days per summer. The PTR program is being proposed in part to allow for a consistent residential Demand Response (DR) program offering across all three major California investor-owned utilities, and in part to achieve additional DR participation from residential customers who might not otherwise be reached by residential CPP rates alone. By PG&E’s proposal, the PTR program will be available to customers starting in summer 2010. The PTR program would be established as an overlay to the customer’s otherwise applicable residential tariff (OAT) by applying bill credits of $0.60 for each kilowatt-hour (kWh) reduced during an event day. The energy reduction from each event will be measured against a customer-specific reference level (CRL). The proposed peak period times are from 2:00 p.m. to 7:00 p.m. PG&E also anticipates initiating CPP calls and PTR events on the same summer peak days. Because there is no downside risk, PG&E recommends that all residential customers be automatically enrolled in PTR once they are fully connected to the network, unless they are enrolled in CPP. Automatic enrollment in PTR overcomes the hurdle of inertia (i.e., maintaining the status quo) that comes with recruiting customers onto a new program. In addition, the positive reinforcement provided by a “carrots only, no sticks” approach facilitates customer acceptance, since it will guide them towards understanding dynamic rates without the possibility of a higher bill. As with the CPP program, PG&E proposes to restrict eligibility to individually-metered bundled service customers. Master-meter accounts would be excluded from the program because it would not be possible to determine load reductions for individual tenants. Net-metered accounts would be excluded from PTR because these customers’ loads are served by a combination of their own equipment and utility generation, and it would not be possible to evaluate demand reductions for such customers independently of changes in output from their customer-owned generation equipment. Finally, direct access and community choice aggregation customers would be excluded from PTR, because the generation portion of their service requirements is provided by third parties. PG&E has evaluated potential interactions between the CPP and PTR programs, with the expectation that customers may want guidance in helping choose between these two demand response participation options. Its analysis shows that customers who are believed to have significant central air conditioning (CAC) usage would divide almost equally between finding CPP vs. PTR participation most advantageous. Also, nearly 90% of customers who are not believed to have significant CAC usage would be better off on CPP than under PTR. Nonetheless, PG&E does not expect high levels of initial CPP enrollment from customers without CAC, because non-CAC customer savings under CPP would still be relatively modest and because PG&E’s marketing efforts for CPP will be focused on customers with significant CAC loads. Event phase: Media and PR during events focused on immediately notifying customers an event is in effect. The day of the event activities will include newspaper, spot radio, TV and geo-targeted online efforts. The level of media available is constrained by the fact that events are not known more than 24 hours in advance. PG&E began the PTR program in 2010 and will not have the SmartMeter Program Upgrade technology and features, including interval billing, fully deployed in the PG&E service territory that year. As a result, the marketing campaign will be limited geographically in 2010 and is estimated to cost $3.4 million. Years 2011 and 2012 are estimated at the full $7.5 million annual cost for the two-phase education strategy. Years 2013-2030 have a lower annual estimated cost of $1.8 million due to the assumption of a transition to a more direct method of event notification through in-home displays and enabling DR technologies the customer will choose to install. The CPUC deferred the PTR program design to PG&E’s November 2009 rate design window filing, where they will require PG&E to propose a two tier PTR incentive design and the associated PTR program costs for such a design. Hopefully, this cooperative effort will allow time for the Commission to adopt and implement a two-tier design for PG&E in time for the anticipated Summer 2010 start of the program. Advanced Underground CAES (See my CAES Blog Article) Demonstration Project Using a Saline Porous Rock Formation as the Storage Reservoir - Build and validate the design, performance, and reliability of an advanced, underground Compressed Air Energy Storage (CAES) plant using a saline porous rock formation located near Bakersfield, CA as the storage reservoir. The completed Compressed Air Energy Storage project would have a generation capacity of 300 megawatts for up to 10 hours. If it decides to proceed, PG&E will put the project up for bid, with the expectation of going operational by the end of 2014. Sodium Sulfur (NaS) Battery Energy Storage System (BESS) Demonstration Project - In February 2010, The California Energy Commission awarded PG&E $2 million for a 36-month demonstration project to study large-scale NaS battery energy storage. Once installed and operating, this will be the largest stationary battery energy storage system in California. The purpose of this project is to demonstrate a sodium sulfur battery energy storage system. This project will be the first large-scale stationary demonstration of such a battery storage system in California. This installation will be a four-megawatt system with a 28-megawatt-hour storage capacity. The Energy Commission will invest $2 million in this research, which will leverage more than $8 million in co-funding from PG&E, which also anticipates committing $5 million in additional funding for subcontractor work. In this demonstration, two projects will seek to aggregate and value these benefits by developing and evaluating operating profiles designed to improve service reliability, provide ancillary services, and enhance the value of renewable resource integration. Project 1 – 4 MW/28 MWh NaS BESS: In addition to mitigating reliability and power quality events for an on-site customer, this project will offer basic load leveling. The battery will also be able to respond to a regulation signal from the CAISO and may simulate the smoothing of renewable generation. Project 2 – 2 MW/14 MWh NaS BESS: Located at a major PG&E substation, this unit will provide load leveling, optimize a nearby solar PV installation, and participate in the CAISO ancillary services market. EPRI PEV DR Pilot - The EPRI PEV DR Pilot will test baseline functionalities of PEV charging hardware by conducting an end-to-end system connectivity to evaluate potential residential smart charging capabilities utilizing the load management software over the AMI network. The charging hardware will be ZigBee-enabled and will have the functionality to provide charging information for billing to the load management software and the AMI back-end system, while receiving charging schedule and user preference control commands from the load management software. Figure 4-6 illustrates some of the findings of EV studies by EPRI. 10. Lessons LearnedThe problems raised by the massive Pacific Gas & Electric smart grid installation in California will serve as a valuable lesson for other utilities around the world when they begin similar endeavors. Utilities must ensure that customers understand how to fully utilize their new smart meters before they are installed. PG&E’s smart meter installations in the Bakersfield area caused an enormous backlash from customers – a class-action lawsuit was filed representing thousands demanding damages from the utility and third-parties also involved in the $2.2 billion project. Engage Your Customers - Talk to your customers first. PG&E initially took a paternalistic approach, launching its smart metering program and only then engaging with customers. As a result, PG&E encountered severe consumer backlash. Instead, make customers part of the planning and dialogue right from the beginning. Many of the high bill complaints that customers attributed to their SmartMeter™ devices were not caused by the SmartMeter™ devices. Instead, the high bills were caused by rate increases and the effects of residential rate design―along with additional weather-related usage―that occurred contemporaneously with the installation of SmartMeter™ devices. The contemporaneous nature of these changes led to significant numbers of customer complaints, confusion, and dissatisfaction with the SmartMeter™ devices, including misplaced concern about the accuracy of the meters. In contrast with the dissatisfaction encountered when mandatory rate changes coincided with the installation of the SmartMeter™ devices, when voluntary timevarying pricing (e.g., SmartRate™) has been introduced and presented as an option only available when accompanied by a SmartMeter™ device, customer satisfaction with the rate option has been high. According to a 2010 survey, 81 percent of SmartRate customers report being very satisfied with SmartRate. Be Cautious with Version 1.0 - Be cautious about embracing the first version of standards. The Smart Energy Profile, for instance, continues to struggle as it attempts to move from version 1.0 to version 2.0. PG&E calls version 1.0 "not sufficiently mature to support large-scale deployments." And then there's OpenADR, the emerging standard for demand response. PG&E is still evaluating its maturity before deciding whether to roll it out. Prepare for the data tsunami. If I had to pick a single "growth pain" that most utilities are underestimating, I would choose this one. For its part, PG&E is embarking on a $12.3 million program to develop a data warehouse and business analytics engine. Don't overemphasize smart meters. It's the system, stupid. The biggest opportunities lie in making the system itself smart and more efficient. PG&E, for instance, plans to spend as much as $1.25 billion over the next nine years. Up to $850 million of that will be for distribution automation, substation automation, wide-area management systems and similar system upgrades. CISCO - Pacific Gas & Electric is asking Cisco Systems for technology that could help about 75,000 California businesses manage their electricity better. That's not to say that PG&E has settled on Cisco for the job, or that it will get done at such a large scale if the $85 million project doesn't get a stimulus grant from the Department of Energy. Hal La Flash - PG&E Director, Emerging Clean Technologiestalks about smart grid, cars and the future of renewables.